A collection of language-driven, imaginative poetry from the winner of the 2015 National Poetry Series Open Competition. 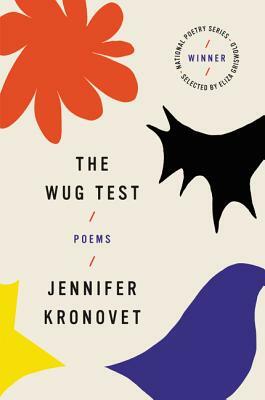 Jennifer Kronovet’s poetry is inflected by her fraught, ecstatic relationship with language—sentences, words, phonemes, punctuation—and how meaning is both gained and lost in the process of communicating. Having lived all over the world, both using her native tongue and finding it impossible to use, Kronovet approaches poems as tactile, foreign objects, as well as intimate, close utterances. In The Wug Test, named for a method by which a linguist discovered how deeply imprinted the cognitive instinct toward acquiring language is in children, Kronovet questions whether words are objects we should escape from or embrace. Dispatches of text from that researcher, Walt Whitman, Ferdinand de Saussure, and the poet herself, among other voices, are mined for their futility as well as their beauty, in poems that are technically revealing and purely pleasurable. Throughout, a boy learns how to name and ask for those things that makes up his world. Jennifer Kronovet is the author of the poetry collection Awayward. She cotranslated The Acrobat, the selected poems of experimental Yiddish writer Celia Dropkin. Under the name Jennifer Stern she cotranslated Empty Chairs, the poetry of Chinese writer Liu Xia.